In this segment of The Irari Report interview with security icon and presidential candidate, John McAfee, Ira Winkler and Araceli Treu Gomes ask McAfee about the political party that he formed, The Cyber Party.McAfee tells Ira and Ari about the Cyber Party’s platform that focuses on Privacy, Freedom and Technology. In this segment of The Irari Report interview with security icon and presidential candidate John McAfee, Ira Winkler and Araceli Treu Gomes ask McAfee about the political party that he formed, The Cyber Party. 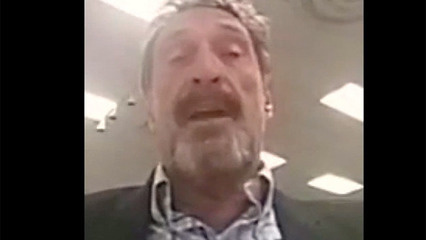 McAfee tells Ira and Ari about the Cyber Party’s platform that focuses on Privacy, Freedom and Technology. McAfee talks about the importance preparing for the next cyberwar, the lack of technology knowledge and flaunting of ignorance by Donald Trump and Hillary Clinton, the need to decrease the size of the US government, how to save money by just sending government workers home, while keeping them on salary, disbanding the TSA and hiring air marshals, among other concerns.